Pictured is Representative Jim Bridenstine. Mr. Bridenstine represents the First Congressional District in the state of Oklahoma in the United States House of Representatives. According to Environmental Action, Mr. Bridenstine recently gave a speech on the House Floor "demanding that President Obama apologize to his constituents for funding research on climate change." 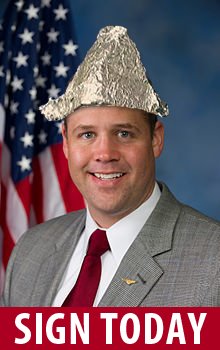 With some justification, I think, Environmental Action has determined that this qualifies Mr. Bridenstine for the "tinfoil hat club" - and they have garbed him accordingly in this picture. The image is not from Mr. Bridenstine's official House of Representatives website. While I concur that Representative Bridenstine is way off base on his views about climate change, I am a bit puzzled by the "call for action" that Mr. Bridenstine's speech evoked. Environmental Action sent out an alert (which I received) asking its supporters to "sign our petition today demanding Bridenstine and the rest admit climate change is real..."
This recommendation does not actually seem all that persuasive, to me. I have signed many online petitions, asking various state and federal officials to take various kinds of environmental and other actions, and so I am quite familiar with the "TAKE ACTION" button on my computer screen, the button that will include my name in such mass communications, generated by an online alert. Telling an elected or other official that I support a particular action does convey at least a small amount of new information to the official. It tell the official what my position is. If thousands or tens of thousands of people convey the same message, that might have an impact, and so I think it's worth the thirty seconds or so it takes me to push the online button. Telling an official to "have a different opinion," however, without submitting anything by way of facts or evidence that should be convincing that the official's opinion should change, doesn't seem calculated to be persuasive. Instead, that kind of communication seems designed only to make me "feel good" about striking out against stupidity. In this case, I didn't push the "TAKE ACTION" button. The call for action on Representative Bridenstine's stupidity, however, did start me thinking about how well these online petition drives advance democratic self-government - and I mean the ones I actually sign. While there is certainly nothing wrong with signing them (at least in my opinion), none of us should be misled that large quantities of signers add up to any real political change. If we are going to turn around federal policy on climate change, we will need lots more than online petitions with tens of thousands of signers. Quantity is not enough, and I think groups like 350.org are moving in the right direction.